Supporting Payday 2 for as long as they have, Overkill Studios must have learned it is indeed better to give than receive. This year, they are embracing the spirit of the season and offering a Christmas-themed mission completely free of charge. You don't have to reciprocate, of course. You and your three masked friends can keep stealing other people's money and gunning down rent-a-cops without a care in the world. 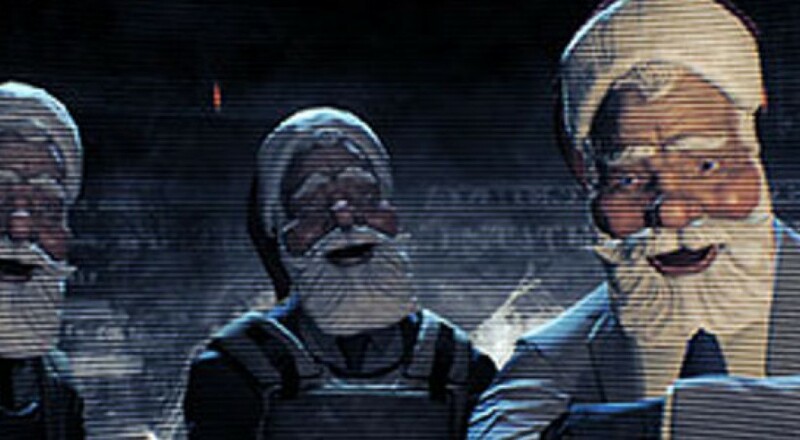 Ever notice the similarities between the clowns of Payday and St. Nick himself? Both attempt to infiltrate a location undetected by prying eyes, and both leave presents for good folks. Except one leaves toys, and the others leave plastic explosives. And while Santa jumps straight back up the chimney, the clowns stick around to jack people's hard earned cash and put bullets into law enforcement officers. Payday 2's new mission is the "Charlie Santa Heist." Check out the trailer below. Like all of the other missions in Payday 2, the clowns (or in this case, the Santas) have several different options in cracking open this bank like the fattest present under the tree. Wanna do it Ocean's 11 style? You can stealthily pop some guards, steal the appropriate key cards, and hotwire your way to victory. For those of you itching to goose your kill count, just run on in with a vault drill and some assault rifles and see just how high you can make that pyramid of cop bodies. Those Santa masks are available for free if you join up with the Payday 2 community. Otherwise you'll have to wait until next year to gun down fools while dressed as one of the most beloved characters of all time. Page created in 0.3237 seconds.